Grand Marshal, the Grand Lodge of the State of Israel. The following is directed towards all the ladies married to, or partners of, Freemasons. It is designed in order to give you a general explanation as to why we men are out many evenings and, at the same time, anticipating your future understanding as to why we go. It has been said that God made man before woman so as to give him time to think of an answer for her first question, so we shall try and answer the questions before they are asked. The man in your family is a member of the Masonic Fraternity. He is a Mason and you are now a Mason's Lady. We are known as blue Lodges & we extend our greetings to you. While you personally have not joined our organization, there are certain things that might be helpful for you to know in the future [if you haven't already worked them out or been informed otherwise] and at the same time, there are matters of general interest about your Mason and his Fraternity that we think you would like to know. When and where did Masonry begin? The Fraternity of Ancient Free and Accepted Masons is the oldest and most widely known fraternal organization in the world. It has its roots in antiquity and is directly descended from the association of "operative masons," the cathedral builders of the Middle Ages, who traveled through Europe employing the skills of their craft. The organization, as we know it today, began in 1717 in England ,where the cathedral building was on the decline and the "operative masons," or "free masons" as they were known, started to accept members who were not members of the mason's craft, calling them "speculative masons" or "accepted masons." Freemasonry invariably exists in democracies for in democracy your vote counts. When democracy is threatened Freemasonry may have to go underground, concomitant with a rise in anti-Semitism. It did not exist under Russian communist rule and will not be found under strict Islamic regime. Freemasonry was subsequently exported abroad to Europe and the USA. Through out the world there are approximately eight million Freemasons, of which nearly three million of them reside in the United States. In Israel we are about 1400 strong with 64 lodges operating in 9 languages. The basic purpose is to make "better men out of good men", better fathers, better husbands, better brothers and better sons. We try to place emphasis on the individual man by strengthening his character, improving his moral and spiritual outlook and broadening his mental horizons. We try to build a better world. It is an approach to life and living, by building better men to work in our communities. It teaches moral lessons and self-knowledge through participation in a progression of allegorical two-part plays, which should be learnt by heart and performed within each lodge. We believe that these principles represent a way of achieving higher standards in life. Only adult males, 18 years of age or older, who fulfill recognized qualifications, of which a belief in a Supreme Being is essential, together with appropriate standards of character and reputation, may be accepted for membership. The answer is simply NO. A secret organization is one which conceals its membership, has secret meeting places and of which the public has little knowledge regarding its organization or its principles. This does not fit the Masonic Fraternity at all. Yes, our meetings are private occasions open only to members. The meeting places and halls used by Freemasons are readily identifiable. There is no secret about any of its aims and principles. Indeed we are encouraged to speak openly about our membership, while remembering that we undertake not to use it for our own or anyone else's advancement. Like many other societies, it regards some of its internal affairs as private matters for its members; yet the rules and aims of Freemasonry are available to the public. Our secrets are very few in number and deal with methods of personal recognition, some details of our degrees and the privacy of each member's ballot. Indeed many of these 'secrets' are readily available today on the internet. We all have secrets, like the pin number with which you need to access your bank account - nothing to be ashamed of. Freemasonry is not a religion, although it is religious in character. It has no theology and does not teach any route to salvation. Every applicant for the degrees in Freemasonry must express a belief and a trust in a Supreme Being, as afore mentioned. Masonry does not take the place of religion, but stresses personal commitment, and involvement in the individual's faith community. Every lodge meeting is opened and closed with a prayer. Its ceremonies reflect the essential truths and moral teachings common to many of the world's great religions. However no discussion of religion is permitted in lodge meetings. The Masonic fraternity encourages every member to attend and support the religion of his own choice. Lessons in Masonry are taught in three separate stages or degrees in our Masonic Lodges. The degrees, in order are Entered Apprentice (First Degree), Fellow Craft (Second Degree), and Master Mason (Third Degree). Each degree blends Masonic moral philosophy in a unique lesson that is intended to have a serious impact and influence on the man who receives it. As a fraternity, having joined, he is now known as a brother. What are Masonic aprons and gloves? An apron was worn by Operative Masons to protect themselves from rough stones and tools. Presently, it is a badge of fraternal distinction. During his first degree, each Mason is given a plain white leather apron; it represents the white lambskin, a symbol of innocence. The leather apron becomes a keepsake throughout his life and finally, at his passing in some places it is worn in death as an eternal symbol of hope. In some lodges your Mason received two pair of white gloves, one of which was for the lady he held most dear in his heart. Some only have one pair but he should tell his wife and family where he keeps his gloves & apron. For, in times of severe distress, it is quite in order for a lady to present herself to any senior brother of the Lodge, bearing the gloves or apron, requesting assistance, which we are honour bound to acknowledge. The most widely recognized symbol of the Fraternity is the Square and Compasses with the letter "G" in the Centre. Members wear it to remind themselves of their obligation to the lessons learned in their Lodges, and to identify their membership to other Masons and all people. Masonic symbols have wide meanings, some directly related to the tools used by actual Operative Masons and some represent the need for order and direction in life. The letter "G" represents Geometry and just happens to be the initial of God, in the English language, the Supreme Architect of the Universe. Lodges meet in regular monthly sessions and on such other days as are necessary to conduct its business and ritualistic work. Although every Mason's attendance is earnestly solicited, it is not intended that a Lodge should interfere with one's regular vocation or duty to family, God, or country. Your Mason has invested time and money in joining our Fraternity. He can best receive all that he should by frequently participating in its deliberations and events. We hope that you will approve and encourage him to attend regularly, and we also hope, that you, too, will join us whenever possible for the guest activities at the Lodge. Should I contact anyone when my Mason is ill or hospitalized? In the event a brother becomes ill, his Lodge would certainly appreciate knowing. You may call the Master, Wardens or Secretary of the Lodge. (The lodge's monthly notice has the phone numbers of the Master and Secretary printed on the front cover). Your Mason has joined an organization which wants to assist him and you when in need, but we occasionally need your help to be able to do that. 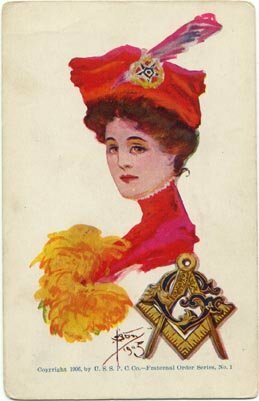 Countless opportunities abound through active participation and membership in any of the numerous Masonic-related ladies' organizations, especially abroad. But more importantly, here in Israel, you are encouraged to share in the many social activities, parties, dinners, dances, tours, civic events, and charitable efforts of the Lodge. Non-Masonic friends and families may also take part in many Masonic programmes. We hope now that you will be even more proud that your man has chosen to become a member of the world's oldest and best fraternity and we , your men, welcome you as one of "The Masons' Ladies." I have been tried through the ages, and am found to be true. In my heart are wisdom and strength and courage for those who ask. Upon my altars is the Book of Holy Writ, and my prayers are to the One Omnipotent God, my sons work and pray together, without rank or discord, in the public mart and in the inner chamber. I lift up the fallen and shelter the sick. I hark to the orphans' cry, the widow's tears, and the pain of the old and destitute. I am neither church, nor party or school, yet my sons bear a full share of responsibility to God, to country, to neighbor and themselves. At the end I commit them, as each one undertakes the journey beyond the vale into the glory of everlasting life. I ponder the sand within the glass and think how small a single life in the eternal universe is. Always have I taught immortality, and even as I raise men from darkness into light, I am a way of life. Note: I acknowledge that I gleaned several items, in part, from different sites to form a new whole giving more relevance to the subject.